What is the odd connection between the Austin Lounge Lizards and the musical She Loves Me? The last time we saw She Loves Me, back in 2014 at the Chance Theatre, we saw an afternoon matinee, and then rushed to Culver City to see the Lizards at Boulevard Music. Last weekend, we actually moved our tickets for She Loves Me at Actors Co-op (FB) to Sunday so we could see the Austin Lounge Lizards at Boulevard Music on Saturday night. We still rushed on Sunday: this time from Stitches So Cal in Pasadena to Hollywood for She Loves Me. Oh well, at least it allows me to repeat my description of the show itself. So how did Actors Co-Op do, when compared to Chance? Under the direction and choreography of Cate Caplin (FB), the actors were clearly having fun with the piece, and that fun was projected to the audience. The overall company was quite fun to watch, and there was lots of joy in the production. In the lead positions were Claire Adams as Amalia Balash and Kevin Shewey (FB) as Georg Nowack. We had seen both before in the Actors Co-Op production of Violet back in May: they were strong then, and they gave strong performances now. They have great singing voices, wonderful personalities that come through in their performances, and a nice chemistry between the two of them (demonstrated exceptionally well in the second act). In the second tier, we had the other clerks at Maraczek’s: Darren Bluestone as Steven Kodaly, Beau Brians (FB) as Arpad Laszlo, Avrielle Corti (FB) as Ilona Ritter, and Tim Hodgin (FB) as Ladislav Sipos. I was really taken by the performances of Corti and Hodin. Both had these wonderful twinkles and characterizations that made them a delight to watch; both also sang well. Brians brought a great boyish charm to Arpad, and was strong in his numbers. I was a bit less taken by Bluestone: he had fun with the Gaston-ish primping, but otherwise, I got no real sense of his character or what he was bringing to the role. In a slightly smaller role was Greg Martin (FB)’s Mr. Maraczek. He brought the right amount of gruffness and tenderness to the role, and was fun to watch. Rounding out the cast in small named roles and ensemble positions were Carolyn Carothers (FB) [Parfumerie Customer, Cafe Patron]; Cy Creamer (FB) [Keller]; Phil Crowley [Headwaiter]; Tyler Joseph Ellis (FB) [Busboy, Arpadu/s]; Rachel Geis [Parfumerie Customer, Cafe Patron]; and Carly Lopez (FB) [Parfumerie Customer, Cafe Patron]. All were fun to watch, especially the mix in the 12 Days to Christmas sequence. The customers, in particular, brought some interesting and different characterizations to their tracks each time they appeared. Understudies were Lea Madda (FB) [Ilona Ritteru/s]; and Susanna Vaughan (FB) [Amalia Balashu/s]. The biggest difference from the Chance production was the orchestra. Whereas Chance had a single piano and gypsy violin, Actors Co-Op had 6 pieces: Keyboards (Anthony Lucca, who also served as conductor); Violin (Miyuki Miyagi); Cello (Cyrus Elia); Reeds (Austin Chanu); Trumpet (Nathan Serot); and Percussion (Ian Hubbell). The orchestra had good sound, although a few notes sounded a bit off. Turning to the technical and production: Stephen Gifford (FB)’s set design was, as usual, elegant and worked well within the confines of the Schall Theatre space. It was supported by Lori Berg (FB)’s property design. Michael Mullen (FB)’s costume design also worked well in conjunction with Klint Flowers wig, hair, and makeup. Sound design was by Adam R. Macias, with lighting by Luke Moyer (FB). Derek R. Copenhaver (FB) was the stage manager, assisted by James Ledesma (FB). Other credits: Heather Chesley (FB) [Artistic Chairwoman]; Selah Victor (FB) [Production Manager]; Nora Feldman [Publicity]. 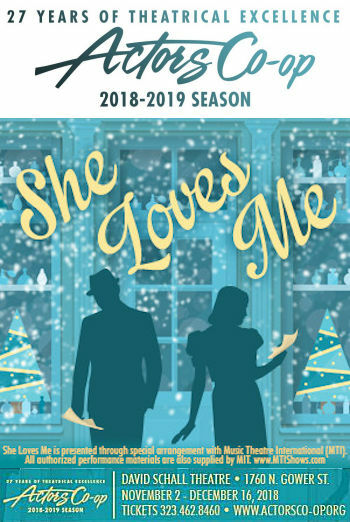 She Loves Me continues at Actors Co-op (FB) through December 16, 2018. It’s a cute show; you’ll enjoy it. Tickets are available through the Actors Co-Op Website; discount tickets may be available through Goldstar. Next weekend is very busy: Dear Even Hansen at the Ahmanson Theatre (FB) and A Bronx Tale at the Hollywood Pantages (FB), as well as A Day Out With Thomas at Orange Empire Railway Museum (OERM) (FB). The third weekend of November brings Beyond Jacobs Ladder from Jewish Woman’s Theatre (FB) at our synagogue on Saturday, and Finks at Rogue Machine Theatre (FB) on Sunday. Thanksgiving weekend has Steambath at the Odyssey Theatre Ensemble (FB) on Saturday and Remembering Boyle Heights at Casa 0101 (FB) in Boyle Heights on Sunday. December starts with the Annual Computer Security Applications Conference (ACSAC), followed by a hold for the Canadian Brass at the Saroya [the venue formerly known as the Valley Performing Arts Center (VPAC)] (FB). Then we may travel up to the Bay Area for Tuck Everlasting at TheatreWorks Silicon Valley (FB) (although that is starting to look less likely).